Unlike Stauskas, Gary Harris was not as impressive on paper. Harris' profile is decidedly average in terms of usage and efficiency overall, as his 16 possessions per-game and 1.02 points per-possession both rank very close to the group mean. Aside from the fact that he used an above average 23.2% of his possessions in transition, Harris' usage distribution reads fairly similar to the average 2014 shooting guard prospect. Harris's shooting breakdown, however, stands out in two areas that explain his middle-of-the-road efficiency. 74.7% of Harris's shot attempts last season were jump shots, the second largest percentage of any player in this group. He scored a top-5 ranked 1.05 points per-shot on those attempts. In contrast, Harris scored .982 points per shot around the rim in the half court, the 3rd lowest mark among players in this group. Getting to the rim for just 1.6 shots per-game in the half court, Harris didn't do much damage in close outside of transition, limiting his efficiency despite his solid shooting from the outside. Though these numbers don't paint Harris in the most positive light, it's worth noting that much of Harris's appeal is lost in a study such as this one. His coachability, willingness to defend, and basketball IQ don't show up here, and while those attributes, along with his shooting ability, give him plenty of appeal at the next level, he does have room to improve his ability to create his own shot and score efficiently inside. 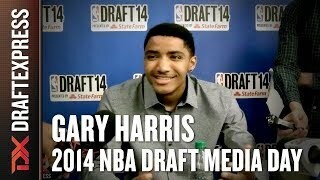 We joined Gary Harris as he works out in preparation for the 2014 NBA Draft, and discussed a number of topics with him, including what he's trying to improve on in the short-term and what he feels he can bring to a NBA team. Gary Harris is considered one of the best shooting guard prospects in this draft, thanks to his strong combination of shooting, defense and basketball IQ. Now that Harris' college career is over, we can take a step back and conduct an inventory of everything he displayed this season as an NBA prospect, as well as the things he still has to improve on. Harris has average physical tools for a NBA shooting guard, standing anywhere from 6-4 to 6-5 in shoes with a 6-7 wingspan. He's not an exceptional athlete to compensate, possessing neither great quickness or overwhelming explosiveness, even if his strong build and nice fluidity helps make up for that somewhat. Harris has nice versatility for a shooting guard, starting with his excellent perimeter stroke. He is very effective with both his feet set and off the dribble, making 40% and 41% of his attempts in these situations respectively. He has good mechanics and range, and has the added bonus of being capable of coming off screens, which is another tool that can be utilized by his NBA coach in the half-court. If a defense is aggressively trying to take away his ability to make shots from beyond the arc, Harris knows how to create space for himself to get his jumper off in the mid-range, using his strong frame, and can also attack a closeout semi-effectively in a straight line to the rim. Harris is also an excellent defender, capable of guarding both backcourt positions. He has outstanding fundamentals on this end of the floor, always getting in a low stance and putting very good effort in, and showing excellent awareness both on and off the ball. A physical player who uses his strong frame well, Harris has very good anticipation skills, which allows him to get in the passing lanes regularly and even come up with an occasional block. He was very well schooled under Tom Izzo, and does a good job in team concepts, which should help him get on the court relatively quickly in the NBA. Harris has a strong basketball IQ in general, which translates to the offensive end as well. He doesn't turn the ball over very often (2.1 per-40), and is an unselfish passer who executes well in the half-court. He'll generate a couple of assists each game by making a simple extra pass ahead in transition or finding an open shooter or cutter within the flow of the offense. At the same time, Harris' average physical tools may make him somewhat one-dimensional in the NBA. His efficiency dropped off from his freshman to sophomore season (59% to 56% TS%) as his role increased, as he's not particularly effective when forced to put the ball on the floor and make something happen, both in the half-court and even in transition (54% FG%). Harris struggles to create high percentage looks for himself and doesn't get to the free throw line at a great rate to compensate. Rarely called upon to make a play in one on one situations, Harris is just an average ball-handler at this stage, not doing a great job of getting low to the ground and lacking the first step or overwhelming quickness needed to turn the corner against better defenders. He's mostly a straight-line, downhill dribbler, which hurts his efficiency as a scorer inside the arc (51% 2P%), and renders him largely ineffective as a paint-scorer in the half-court. He only converted only 25 shots at the rim in the half court in 35 games this season, and did so on middling efficiency, hitting 45.5% of his shots at the rim in these settings, a very poor rate. Instead, Harris relies heavily on his jump-shot for production, looking to pull-up off the dribble almost exclusively as soon as he puts the ball on the floor. Long 2-pointers are universally considered bad shots in today's NBA, so can Harris improve his shot-creation ability to develop into an efficient scorer in the NBA? As good of a shooter as he appears to be, he only hit 35% of his 3-pointers on the season. With that said, Harris is very young for his class, only turning 20 in September (making him younger than many freshman), which leaves some room for optimism that he can continue to improve as his career moves on. His strong intangibles (feel for the game, toughness and unselfish style of play) further increases the likelihood that he will put the work in to reach his full potential, so it's not out of the question that a young team with a couple of heavier usage players already in place decides to pick him in the late lottery and see how he continues to develop. We've taken a more visual look at his strengths and weaknesses thanks to game film from Michigan State in the following video scouting report, courtesy of Mike Schmitz.